Celebrate IBMD in style and help spread the word wherever you go! The 7th annual IBMD is set to take place on Sat. Aug 3, 2019. SUPPORT: Support International Blues Music Day. Your contribution will help us shine a global spotlight on the blues music genre year after year. UPDATE: The inaugural IBMD on Sat. Aug 3, 2013 featured over 100 simultaneous blues concerts and events around the world with hundreds of media outlets and thousands of music fans participating IN OVER 50 COUNTRIES. The 4th annual IBMD is set to take place on Sat. Aug 6th, 2016. MISSION: To celebrate, promote and preserve the rich legacy, tradition, and future of the great American art form and international language known as blues music. 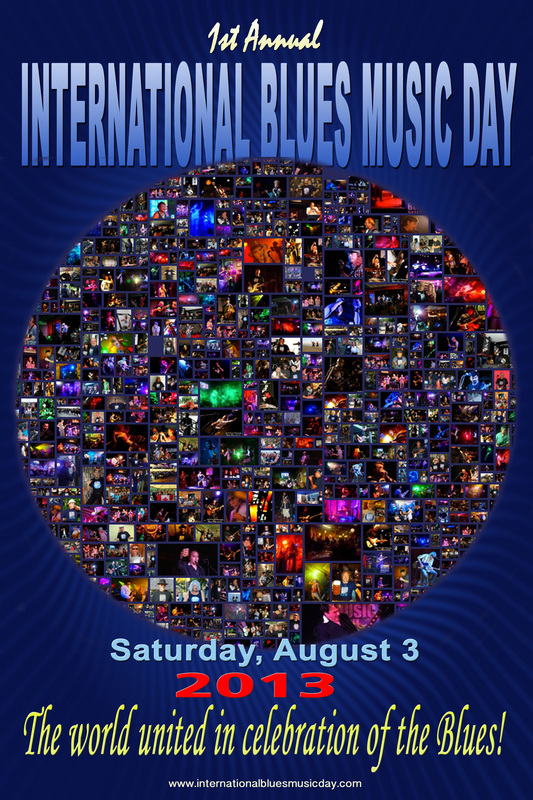 International Blues Music Day counts on the financial support of Blues fans & supporter's donations and memberships. You are an individual, organization or corporation that wants to support our grassroots efforts to establish and promote an International Blues Music Day. You want to help us organize and support hundreds of worldwide events annually on IBMD with a paid membership or donation. All donations are used for direct costs involved in organizing, promoting, advertising, printing, mailing, programming, permits and production of live events related to International Blues Music Day. You will be supporting perhaps the single most important and exciting blues initiative to come along in years. A designated, annual, internationally recognized "day" to help honor, celebrate and promote the blues music genre in a meaningful way on a global scale and grow from year to year and continue for generations to come. Each of us has the duty to support the music we love. Your IBMD membership is evidence that you understand that a blues fan must be the first line of support. You can do this by participating in the IBMD activities in your local areas, by purchasing the music of your favorite Blues artist AND BY BECOMING A SUPPORTING MEMBER. We will recognize and mention your support on our website, in our program guides and provide reciprocal links to your website. We will offer our supporting members any FREE or discounted passes to IBMD concerts and events FIRST before offering them elsewhere. Each member gets to vote for a member of the Board of Directors. Each member receives a membership card and a window decal proclaiming them a Proud Supporter of International Blues Music Day. Higher levels of support bring additional premiums. By becoming a member to support the promotion of International Blues Music Day you are helping us accomplish a significant achievement to promote and honor blues music on a global scale for generations to come. We would like to THANK YOU VERY MUCH in advance! Since it's conception around August 2011, IBMD has been taking hold in the hearts and minds of thousands of blues lovers around the world as an idea who's time has come. But until now there has not been an actual date set or organized mechanism for physical events to take place around the world to celebrate & promote IBMD. Celebrating an International Blues Music Day enhances the awareness, excitement, celebration and recognition of a truly American art form, it's many legends and practitioners, it's vast musical influence and the continuation and promotion of the blues. In addition IBMD has the unique potential to be one of the most important and exciting initiatives to further the cause of promoting blues music on a global scale for generations to come. The campaign calls for up to $100,000 to create a viable, professional, international organization capable and tasked with honoring blues icons and the blues music genre year-round; culminating in hundreds of annual, worldwide events in celebration of IBMD. To enable and encourage more folks to listen to and learn about the music; and enjoy historic gems, culture, mythology and wealth of music of this all-American art form. The IBMD website, office, promotions, and hundreds of simultaneous worldwide events will be the venues for serious blues fans, curious music lovers, and wide-eyed students to experience and participate in the unlimited potential of expanding the worldwide blues market place. It will facilitate audience development , provide employment opportunities including thousands of potential gigs for blues musicians and it will expose, enlighten, educate, and entertain. We see this initiative as having an unlimited potential. Thank you for considering a donation to IBMD.